The day had finally arrived! Bound for Setthorns Campsite in the New Forest our first trip out for our new van. Even the misty November rain can’t dull my excitement. The rain had stopped on arrival and we were greeted by very cheery wardens. Despite the weather and time of year the site was still quite busy. We chose a pitch nestled in the woodland and started unpacking and putting things away. 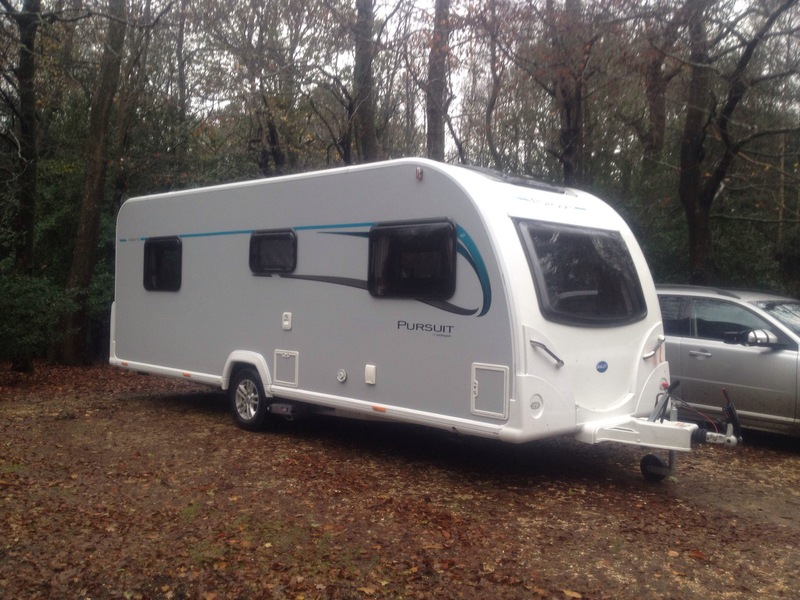 Where to put things added to the excitement of caravan newness. 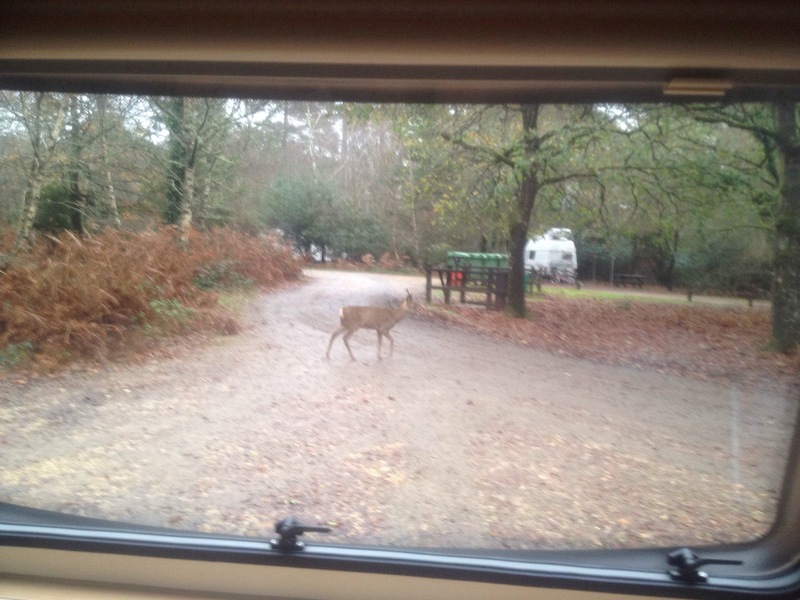 Although the caravan is a lot bigger than our little 2 berth the kitchen area is compromised. Choosing to cook in the van rather than eating out means I like to take my gadgets along, halogen oven, slow cooker, actifry and so the list goes on. Worktop space is minimal so I am going to have to juggle my gadgets on longer trips. Aqua rolls filled, waste tank in place, heating on, kettle on. Time to start to enjoy our new caravan and it’s beautiful first location. The site is set in beautiful woodland with each pitch discreetly tucked away amongst the trees. Cup of tea in hand we sat, warm and cosy, watching birds and squirrels rummaging around in the undergrowth as the light faded. Our first evening was very relaxing, good food, good wine and the radio, with lots of chat about future trips out. 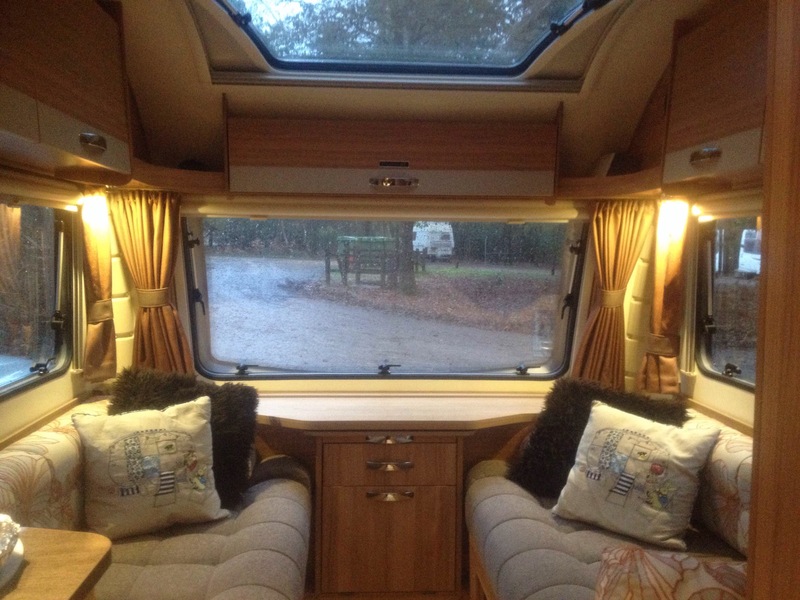 We made a choice when first starting caravanning to be television free for any time we spend away and so far we have stuck to it and don’t seem to miss sitting staring at a screen every night. Time for bed, so nice not having to make the bed up. Our first morning was wonderful. Blinds open to reveal a beautiful young stag sat in the ferns no more then 20 feet away from our front window. He dozed and groomed for more than an hour and then lazily wandered off, grazing as he went. All the while the squirrels were bounding about around him. Who needs breakfast TV with entertainment like that. Bite to eat at lunchtime and then a trip into Brockenhurst for supplies and and a wander around. Brockenhurst is teeming with local shops, butchers, bakeries, grocers, gift shops, cafes and the obligatory small well known supermarket. Due to the weather and time of year the town was relatively quiet. In need of refreshments we found a lovely little tea room, Rosie Lea’s, where we were greeted by a very jovial gentleman. 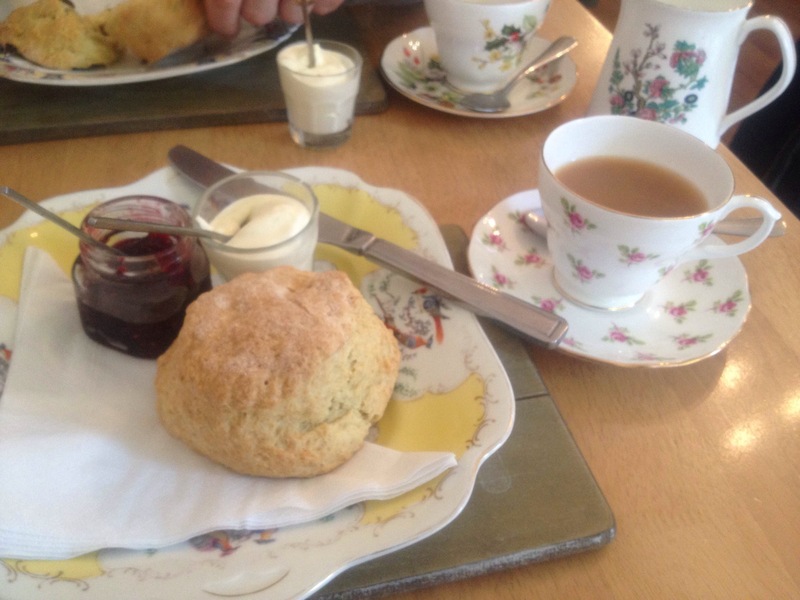 Settled in the window we ordered a cream tea with local damson jam and clotted cream, delicious. Rather than choosing one of the more exotic ranges of tea on display we stuck with good old English Breakfast. Refuelled, time to buy our supplies. Back to the car just as the heavens opened. The wild horses of the New Forest continued grazing roadside on our drive back oblivious to the rain. Back inside the coziness of the van we watched the day slowly turn into dusk, squirrels and birds all scurrying around before they turned in for the night. Blinds closed against the night, radio on, food cooking, time to settle down for the evening. We woke the following morning to a watery sunshine and blue sky. Still very mild for the time of year. Breakfast and a little bit of a lazy morning before starting to pack up to go home. Setthorns will let you stay till as late as 5.30pm on your day of departure for a small additional charge. We decided to take them up on this offer, returning our caravan to storage before daylight starts to fade. It was a great trip. Thanks for your feedback. Please feel free to read the rest of my blogs and share them as you will.